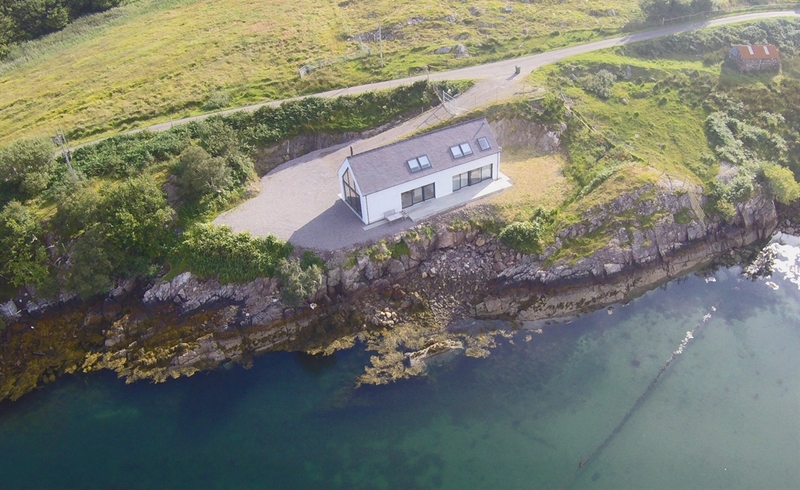 The Net Store is a holiday house built in 2014 on the shores of Loch Beag on the Applecross Peninsula. It has been designed to enjoy the ever changing views across the Minch to the Hebrides. OPEN PLAN KITCHEN, DINING AND LIVING AREA overlooking Loch Beag. The kitchen is equipped with Neff appliances, Dualit toaster and Quooker boiling water tap. TWO BEDROOMS (one king, one twin/superking) with Hypnos beds, Egyptian cotton bedding, duck feather and down duvet and mattress toppers and built in wardrobe storage. BATHROOM and EN-SUITE SHOWER ROOM with marble tiles, underfloor heating and walk-in waterfall shower. GALLERY with sea and hill views. OTHER FEATURES include a wall mounted flat screen SMART TV with Netflix, wireless internet connection, board games, wood burning stove, oak floors with underfloor heating, utility area with washing machine, tumble dryer, clothes pulley, iron and ironing board and teak outdoor furniture. The Net Store is located in the small fishing village of Ardheslaig on the Applecross Penninsula at the mouth of Loch Torridon. It is approximately 70 miles from Inverness where the nearest airport is located. Flights are available from London or Luton, Bristol, Manchester, Birmingham, Belfast, Dublin, Jersey, Amsterdam, Geneva, Orkney, Shetland and The Outer Hebrides.